We’ve been so busy lately that I’ve been very late with my news! No jewellery in this picture! 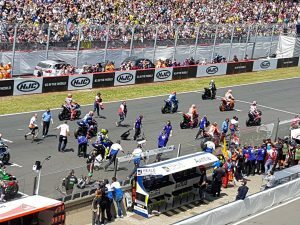 We had a last minute chance of a pair of tickets to Le Mans for the Moto(bike) GP with bike friends of ours. So we dusted down the motorbikes after getting mine out of storage in our garage, bought a couple of ferry tickets and from the 17th to 21st May, spent an amazing weekend in France. Accommodation was 50 minutes ride away from the track in a friend’s house, provided we cat sat 6 cats and the chickens! What a fun time, the noise and excitement has to be experienced. We travelled exactly 700 miles in total. The French were very welcoming, with lots of waves from people in the villages as we passed through. 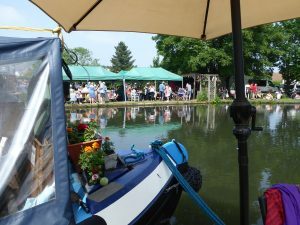 When we arrived back at the boat we had just a few days before moving the boat to Boxmoor for a Canal Weekend Market over the bank holiday. This was run by the Fishery Wharf Cafe which had music, beer and food all weekend. 16 trade boats took part in a very colourful, busy and happy market.